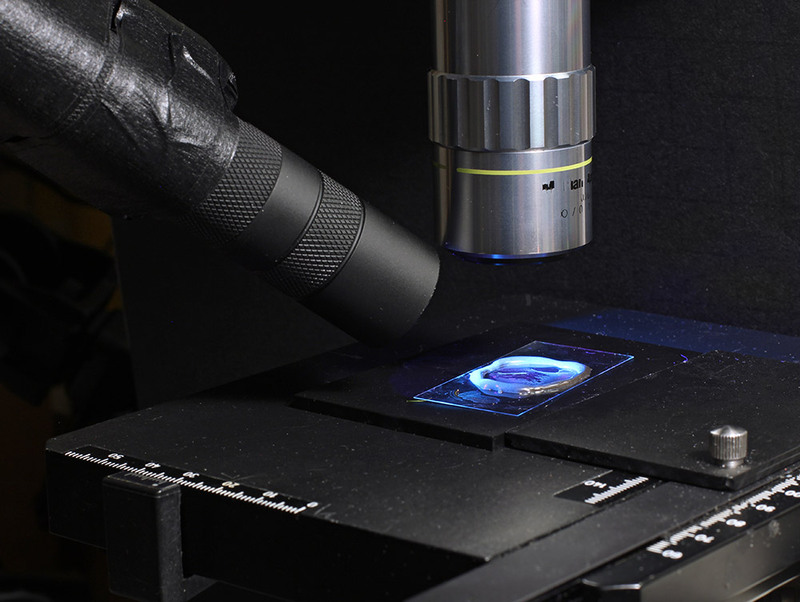 Off and on I have thought of jumping into fluorescence microscopy. I've gathered together the bits and pieces needed to set up one of my Olympus biological BHS stands, but never got enough ambition to make up the light sources needed. (Kudos to Pau for his wonderful solution: http://www.photomacrography.net/forum/viewtopic.php?t=32736 ) I often thought about about Nightsea's elegantly simple system and how something similar would be a natural fit for my MM-11 hybrid scope. I liked the fact that these used rechargeable 18650 Lithium ion batteries, as I have some of these and they can power a light like this for a good long photo session. I purchased both a FGL420 and a FGL435. So far I have only used the FGL420. The filter was placed in the filter drawer above the objectives as indicated by the blue arrow below. The flashlight is held by a small articulating arm. (I use mini Arca type clamps on all my articulated arms). The long thin shape of the light allows it to be positioned close to the subject. I have a regular white light directed on the subject from the other side. I set up the shot using the white light. I also set up the automated stack start and end points with the white light. When I am ready to go I shut off the white light and turn on the UV. This is all new territory for me but the first couple of efforts seems to show that this can be a very viable approach. (And my cost for the light and filter was less than $60). Maybe all this is overdoing the concern. I don't know, but I really don't care. It is not much effort to protect your eyesight. I am using the LED flashlight without an excitation filter. Based on the graph above and the detailed specifications of the FGL420 it looks like I might get away without using one. If I determine that I am cutting it too close I'll try either the FGL435 longpass "barrier" or use a filter on the light (from Ebay seller bjomejag) that sharply blocks anything longer than 390nm. Charles, thanks for posting, your setup is closer to Jacek's, that is also working very nicely. Another filter that works very well as a UV-pass filter is the Baader Venus filter. My lord, it's eye-wateringly pricey, though. I'm hoping to try a slightly different approach, which is to cut up a prototype torch that was made for me and make a thing out of the cut up remainder connected to a lab power supply that I can interchange on the epi component in place of the regular light housing. Would anyone have a contact in the UK, south of London, that could do such cutting work for me? 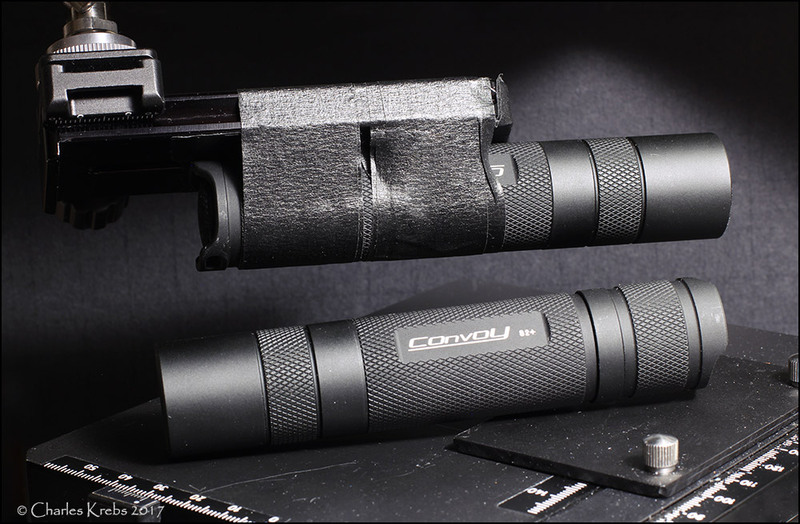 A ZWB2 ( or other ZWB) "black" filter for the torch/flashlight would be good. Unfortunately all the listings I've looked at so far have them as no longer in production. They were only a couple of $. Thank you for your fine efforts, Charles. Those are very helpful to me. I have seen your great fluorescence images, shot using that UV flashlight rig. Are you getting enough chlorophyll fluorescence for video recording, using the same rig? Thanks again. Thanks Charles for posting your very interesting low budget solution. The Nichia you are using seems very usable and practical and cheap. I just ordered one, maybe I should have ordered two. Are you using Nichias at both sides or just one side when shooting. Your Nichia is only 3W but powerful as it is LED and can be held very close to the subject and the spectral output looks also very nice and narrow and there seem to be very little visible light involved. I gather that exposure times and ISO can be kept nicely short/low even with one lamp? I am afraid that my expensive Raytech UV lamp just went obsolete, at least the LW part. I have been using it for macros up to 2X and short stacks also. It has both LW and SW tubes and filters , 6W each, but it is very big and cumbersome and requires pushing up both ISO and exposure times, like ISO 800 and 30s, meaning very long stacking times and a lot of noise. And remember... you can't see 365nm UV light (or anthing shorter than about 390nm). 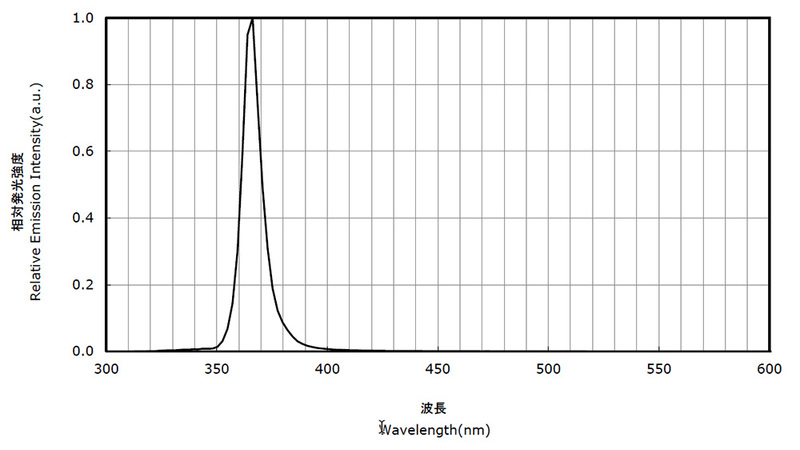 The violet color you see with the Nichia LED is likely just that small trailing off seen in the graph between 390nm and 410nm. You can't see the vast majority of the output. So far just the one. But it does appear that there will be advantages with two with some 3-dimensional subjects and at certain magnifications. Also from the little I know 365nm may not be the best excitation wavelength for what you want to see... perhaps something longer like ~450nm might prove better. It is actually a pretty complex subject (just Google something like: "chlorophyll auto fluorescence, best excitation wavelength" and you will see what I mean.) Hopefully those with more experience than I have will add some information. What I can do is provide the exposure information used for the few shots I've posted. (right now I don't have access to the images,... I will later tonight. Check back late tonight or tomorrow and I'll add it to this post. All were done with a single light. Superimposing the blue and red filter blocks all light. That was the cheapest I could find that worked. Of course you have to work in the dark. Thank you very much, Charles and jcb. It sounds like my video recording will not work, based on those exposure parameters. Lee #363 is cleaner than #721, but it is also less efficient. JCB, would you have a few images to point me towards using that filter combination? one wouldn't want to use something excitable like white paper as a UV reflector. I have read that the dull side of Al foil works well for "fill" light. It appears to be highly similar to, if not the same as, the Thorlabs FGL420 filter that Charles uses. I don't know if Thorlabs charges shipping. So buying from eBay will save $9 + Thorlabs shipping fees. Poking around the internet, there are pieces of work using 405nm lasers as excitation for Chlorophyll A and B. These (and LEDs at the same nm), are much easier to obtain than, and of course not as hazardous as true UV sources. Nice narrow spectrum but narrow beam too - how well can one diffuse a laser? I have tried to photograph fluorescence with 405nm laser pointers (not real lasers!) and I don't think they are suitable for photography purposes. There are also lots of led flashlights available with about 400nm peak light. These are often sold as scorpion flashes. I bought a couple of those also. One was with 50 leds but for fluorescence purposes they are not very good as the spectral peak is fairly wide. The LED Charles suggested is the first cheap and viable alternative to dedicated UV lamps, like Raytech models, to use in photography (that I know of). I searhced for these a couple of years ago, but didn't find anything usable, so bought a Raytech. I did some UV photography yesterday and was going through the options for a background that would yield just a tiny amount of visible light through fluorescence. I was thinking about tin foil and even cut a piece to try it, but I was únsure about its reflective properties and decided against it. As the reflected light is invisible there is not any easy way to figure out how much of it is reflected by the foil. If it has been tried and found OK for the purpose it would be nice here more about it. Maybe it is OK for 365nm UV photography when adequately protected with glasses etc,, but it would be nice to read something about it as I shoot mostly with 254nm light. I don't know if it has already been posted, but if you need an excitation filter to remove the VIS blue and violet at the tail of an UV LED emission spectrum, there is no need to use one of the modern (and expensive) filters for UV imaging on the UV torch. It is enough to use one of the much cheaper legacy filters (U-340 or equivalent, 2 mm thick, is best for a 365 nm LED). 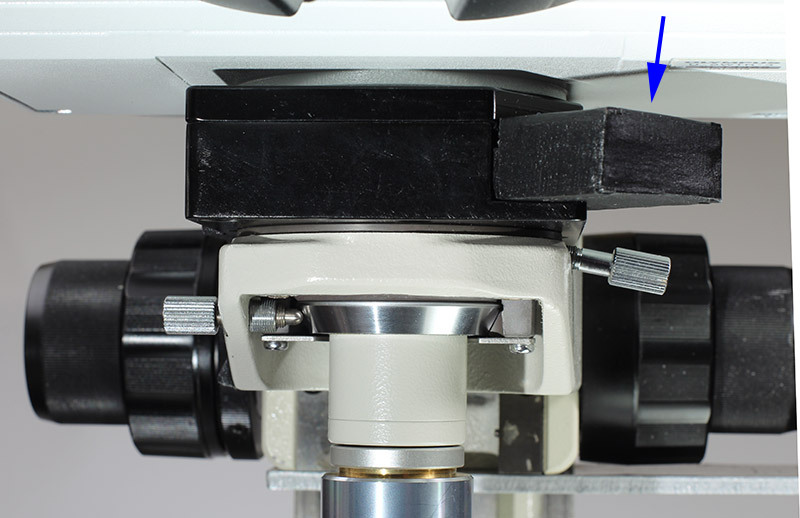 Modern filters for UV imaging on digital cameras are expensive because they must block NIR with an OD of at least 3 or 4, in addition to VIS. Legacy filters like U-340, U-360, UG11 etc. all transmit way too much red and/or NIR for using on a "full spectrum" digital camera. There is no need for this when the purpose is to remove the blue/violet "leak" of a UV LED, because the latter emits no NIR.